Can you send debug logs ? This is what the log shows. 2018-09-25 09:52:46 WARNING (MainThread) [homeassistant.components.climate] Setup of platform broadlink is taking over 10 seconds. I’ve checked the component in details, so basically it’s a broadlink switch that operates just like the MP1 or the SC1 ? It works on basic HTTP ports, no other need ? I already have several Broadlink devices (I love the SC1 switches they work fine, integrate perfectly to HA and are inexpensive !). First let me say that clementTal did a very good job with his custom component for these chinese thermostats. I’m using it with a BEOK TOL-313 for electric heating and it’s running pretty well. My question is: Does anyone know how to dynamically change the schedules config of the thermostat (week and week end periods), for example using the climate.set_schedule service? There is no identity argument witth this service, and I cannot figure out what could be the JSON data format do to it. So after a long wait for the parcel from China, I could finally test this yesterday. I was ready for a while : custom_component installed, configuration prepared, just like I do with the Broadlink components (I love the SC1 switches). So yes it works with the component, and it seems that it will work with my boiler (Wiessman that has over 15 years), as it’s actually a dry contact closed when it goes in heating mode. Too bad Broadlink doesn’t sell a SC1 version with this dry contact. As I don’t need the logic in the thermostat but I want to control the beginning and the end of the heating from HA only, I still have to understand how to tweak the climate control to turn it dumb ! the component doesn’t seem to react to the turn_on and turn_off services, so I used the set_temperature service that contains also the operation_mode option. For the Beok 313 - In addition to this tip, I got rid of the all the component errors and finally got the Climate control to appear on the front end by deleting the folder “–pycache–” that gets generated in the custom component/climate folder. And, also NOT using the the advanced part of the broadlink platform in the config. Thanks for writing this up. I was wondering if you had any other documentation lying around regarding how the HEX actually needs to be composed? I’d like to try and write something else in another language and this would be extremely useful. HI, i dont know why dont work for me. Sometimes, the thermostat goes into ‘unavailable’ and you can see this. Looks like it doesn’t like heavy WiFi traffic. It happened several times at home, only when Zoneminder was in detection mode, so it pulls images from cameras as fast as possible, leaving few bandwidth for other devices. Do you ever have a connection working ? After some tests, I found that the “set_temperature” service, even if it has an “operation_mode” parameter, doesn’t always change the operation mode ! Can’t figure out why. Anyway, the “turn on” action is now one set temperature (very high) and a set_operation_mode “heat”. And the “turn off”, set temperature (very low) and set_operation_mode “off”. I do so to ensure the thermostat by itself won’t start or stop heating if HA didn’t call for. A mi me pasa lo mismo, ¿lo solucionaste?The same thing happens to me, did you solve it? thanks to this webpage, make one with voice control alexa. So i set this up with a no name ebay item, and got the following error. 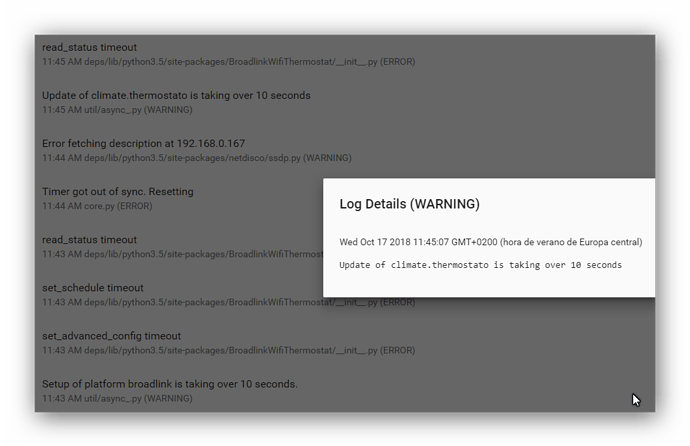 2018-11-09 22:07:05 WARNING (MainThread) [homeassistant.loader] You are using a custom component for climate.broadlink which has not been tested by Home Assistant. This component might cause stability problems, be sure to disable it if you do experience issues with Home Assistant. I had to remove the double speech marks and it worked fine. Hi, is there a way to start this component, so that outside temp sensor is active with automatic profile? If I enter to the platform config " sensor_mode: “1” ". Component starts with outside sensor but in manual mode, and then if I switch from UI to automatic mode, the temp sensor is switched to inside sensor also.